Friday Wrap-Up for December 22, 2017 – News from Off Track Brewing, Bore City, Rockbottom, Tide & Boar, Port Rexton, and much more! It’s the last Friday before Christmas, and that means the last chance for gift ideas for the special someone on your list (and you!). We’ve got a new brewery, plenty of new beers, and promises of beers to come in the new year to get you in the giving (and drinking) mood. So grab a beer, put down the wrapping paper, and check it out! • Off Track Brewing is opening today in Bedford, Nova Scotia. Located at 275 Rocky Lake Drive, the brewery opens today at 3 PM for pints, 4 oz samples, flights and growler and grunter fills. Visitors can get a taste of a handful of the beers made right on site, including their Alias Pale Ale, Good Grief Charlie Brown Brown Ale, Damn Skippy Peanut Butter Stout, Crash Course IPA, and Hoover a Dip IPA. They’ve also announced that they will be open on both Christmas Day (12 – 5 PM) and Boxing Day (12 – 9 PM) for beer emergencies. In fact, the only days they’re closed for the rest of the year are Wednesday the 27th and New Year’s Day. Check this Facebook post for their hours on any of the other days and consider heading on down to sample the wares from HRM’s newest brewery. Congratulations to Allan, Matt, and Jon! • Moncton’s Bore City has dipped their collective toe into the world of hazy, juicy, tropical IPAs with one of their own. There’s a NEW England? is a New England (or North East, depending on who you ask) IPA, hopped with Azacca and Ekuanot/Equinox. No filtering here, folks, as that would strip out lots of those flavours. So embrace the haze and find this 7.5% ABV beer on tap around town and quite possibly at the James Joyce in Fredericton, as part of their rotating line-up of all-NB beers. • Halifax’s RockBottom Brewpub is saying “Merry Christmas” to its customers with two new beers on tap this week. First up is Nitro ESB, a 5.6% ABV English Special Bitter hopped with East Kent Goldings and Fuggles. With “sweet toffee notes derived from dark Crystal malts”, and a firm bitterness (at 40 IBUs) to balance, it was carbonated with nitrogen to give a creamier mouthfeel. Next is Japanese Rice Lager, brewed with equal parts malted barley and rice. Thanks to the high amount of adjunct in this beer, it has a very light body, with “a malty sweet, yet slightly tart, fruit finish”. It was lagered at cold temps for over six weeks, and comes in at 4.5% ABV and 10 IBUs. • TrailWay is bringing back their annual holiday brew, Christmas Rascal, which will be released at the brewery today at noon. The recipe has changed since last year, with this Imperial Milk Stout being conditioned on lots of cacao nibs, vanilla, and a “blend of spices”. Expect a creamy and full mouthfeel, plenty of chocolate character, and a background of vanilla and spice. It’s a big one at 8.5% ABV; cans and pints at the brewery, with a few lucky spots around Fredericton pouring it on tap as well. And please keep in mind that 50% of all pint revenues today will be donated to the Fredericton, so do your part to help out and drop by for a beer or three. And if you bring an item for their food drive, you’ll be entered into a draw to win a TW merch package. • Moncton’s Tide and Boar Gastropub is holding a double-banger of a day today. At 11AM, they will be hosting another one of their Growler Fill Days, featuring a return of their Peach Shake Ale (Peach Milkshake IPA, with peaches, vanilla beans, lactose, and plenty of hops), Young Blood IPA (Hazy yet crisp, with notes of citrus and grass), and the brand new 7.2% ABV Destroyer IPA (featuring Enigma and Mosaic hops, for a meld of tropical, fruit, and dank notes). With 3 kegs of each beer available, they should last until lunch, but there’s no guarantee! And from 1-5PM, their holiday tradition of Free Oysters continues. With the purchase of any drink, you’ll be served a tasty trio of oysters to toast the season. Be sure to drop by! • The Annapolis Cider Company is releasing Wine and Strawberry, the latest in their one-off Something Different series, today at the cidery. This one is an unfiltered, sparkling blend, bringing together dry cider, red wine, and strawberry juice. The hand-picked apples were juiced and cool-fermented before being combined with red wine from local Leon Millot grapes. Cryo-extracted juice from local strawberries was then added to this blend, resulting in a 5.9% ABV “aromatic, medium-bodied cider with soft tannins and bright notes of fresh juicy strawberries”. Every fill of this one will see $0.50 donated to the Wolfville and Area Food Bank. • Today, Saint John’s Big Tide is launching a special beer with a party at the brewpub at 8 pm. Darlings Island American Lager was brewed with a grist of Pilsner and Munich malt; the beer was hopped with Saaz from local hop suppliers Darlings Island Farm. The 5.4% ABV, 43 IBUs beer was brewed a couple of months ago, in order to give it the time to lager (cold-condition) before its release. Speaking of its release, the Release Party will happen tonight, as mentioned; your $25 ticket gets you entry and a pint of the beer, with all proceeds going to Broken Earth (a medical relief mission in Haiti). It’s a great cause, so if you’re in the area and looking to get away from the craziness that is shopping during Christmas, head down to Big Tide! You can reserve your ticket by calling 506-214-3311. • Rose Valley, PEI’s BarNone Brewery has a new beer available this week, Warmer Winter. This 8.2% ABV Brown Ale was brewed with Bryan Carver of DME Brewing Solutions, who boldly loaded up the mash tun with Ginger Snaps, giving it, we imagine, a spicy ginger character to complement an otherwise malt-forward beer. You’ll find a limited supply of bottles available at the brewery as well as at the Charlottetown Farmers Market tomorrow. • A reminder that Port Rexton Brewing‘s Pop-up Shop at 286 Torbay Road is open again this weekend (4-8PM today, 12-6PM tomorrow). Growlers of Mr. Wheaty Pants are available, as well as cans of Chasing Sun NEIPA and T-Rex Porter. And for those in the area, or would like a bit of a drive, their taproom in Port Rexton will be open tomorrow 2-10PM for Tibb’s Eve, for merchandise, pints, and growler fills, as well as cans of Baycation Blonde, Chasing Sun, Horse Chops IPA, and T-Rex Porter. • And speaking of that T-Rex Porter, it’s the base of a very special holiday beer released today. A couple months back, they put some of that beer in French Oak Cabernet Sauvignon barrels to condition along with some locally foraged partridgeberries. The result, which they’re calling Nor’ Easter is 6.5% ABV and 19 IBU and it’s available now in 500 mL bottles at the Port Rexton taproom as well as at their retail outlet in St. John’s. In the interest of letting as many people as possible try this special brew, there’s a 2 bottle limit per-person. So if you’re in Newfoundland and you’ve got a beer lover in your life, we’re guessing this would make a pretty stellar stocking stuffer. Or hey, if you’re the beer lover in your life, maybe skip the stocking and go straight to the enjoyment part. • At Lunn’s Mill in Lawrencetown, NS, they’ve got a new beer courtesy of their assistant brewer, Peter, who took the lead on all aspects of this new brew. As fans of hoppy amber styles (think MBC Zöe and Trailway Good Aura), they’ve been wanting to try their hand at making one for some time. Today’s release, Clever Girl is that beer, based on a grist of Maris Otter pale malt, with honey and chocolate malts for sweet and roasty character. For hops, Amarillo and Centennial were used, both known for bringing grapefruit and other citrus presence along with some floral notes (Centennial) and melon and stone fruit (Amarillo). The batch was double-dry-hopped to encourage a smooth hop character; it finished at 5.5% ABV and 40 IBU so it should be an easy drinker, with a well-defined malt backbone balanced against a bright and prominent hop presence. Available on tap at the brewery now for fills and pints. • And, moving from the Valley to the South Shore of NS, Heritage Brewing in Yarmouth has a brand new collaboration beer hitting the taps, this one done with their downtown neighbours Sip Café. Starting with a porter base, they added fresh-brewed coffee from the gang at Sip along with chocolate soaked in Vanilla Bean Vodka from Annapolis Royal’s Still Fired Distilleries. The result is a smooth beer weighing in at 7% ABV, with plenty of coffee, chocolate and vanilla flavour. Only 180 L was made, however, and some of that has been set aside for Sip Café’s own taps, so if it sounds like your cuppa tea, or, maybe more accurately, cuppa joe, they’ve got a limited amount for growler fills and tasters at the brewery. Otherwise you’ll be waiting for it to appear at Sip, when you might just see a contest to give this brew a name. • 2 Crows received a special care package in the mail this week, just in time for a special collaboration beer that they brewed up yesterday! A picture on their Facebook page gave a glimpse of several delicious-sounding yeast and bugs from Escarpment Labs, including a “Lacto Cocktail” and a “Fruit Bomb Saison Blend” (one with Saccharomyces, and one with Brettanomyces). Escarpment has officially teamed up with 2C for this beer, which while we can’t share all of the details yet, we can tell you that it’ll be funky, sour, and fermented in one of their Calvados oak foedres (now empty thanks to the packaging and release of Never Again, which we mentioned last week). As always, we’ll keep you up to date on the progress of this new beer! Before we sign off today, remember that most (but not all) breweries and taprooms will be closed Christmas Day, and many are adjusting their hours on the 24th and 26th as well. Check social media or call first to avoid disappointment! – Boxing Rock has brought back their Russian Imperial Stout, U-889. Featuring coffee from the Valley’s Just Us! Roaster, and whole Madagacar Bourbon vanilla beans, this 8.89% ABV beer is the perfect pairing for cool nights in front of the fire, or food with friends. Co-owner and -brewer Emily Tipton decided to go the extra mile and cook with it, detailing her recipe and results on their blog. Grab bottles at the brewery, their tables at the Halifax Seaport and Dartmouth Alderney Landing Farmers Markets tomorrow, and at the private stores in HRM. – Next Thursday, Dec 28, Good Robot will be releasing yet another iteration of their Damn Fine Coffee and Cherry Pie Pale Ale (5.5% ABV), this time featuring organic Ethiopian Yirgacheffe (I’m going to trust their spelling of that) coffee beans from Java Blend Coffee Roasters, cold-brewed by Low Point Coffee Co. And a heads up that, due to staff demand, their taproom and brewery will be open regular store hours over the holidays. – After a little adventure in canning line malfunction last Friday (too many hops!) Unfiltered had a fridge full of cans (Hoppy Fingers, Flat Black Jesus, Exile on North Street, and DOA) to start the day on Tuesday, but it’s surely been dented if not decimated over the last three days. Also in the fridge are bottles of their Commissar Russian Imperial Stout. They’ve got store hours from 12-8 PM today, from noon tomorrow (until 8 PM, we suspect), and not again until December 29th, so if you want Unfiltered cans to be part of your Christmas week you’d best be getting on that by tomorrow! Friday Wrap-Up for August 18, 2017 – News from Tatabrew, Annapolis Cider, Lazy Bear, Think Brewing and more! Posted in: Friday Wrap-Up. Tagged: 2 Crows Brewing, ANBL, Annapolis Cider Company, BarNone Brewing, Battery Park, Bishop's Cellar, Good Robot Brewing, HopYard, Lazy Bear Brewing, Low Point Coffee Co, Moth Lane Brewing, Motion Bay Brewing, North Brewing, PEI Brewing Co., Roof Hound Brewing, Split Rock Brewing, Stillwell Beer Bar, Tatamagouche Brewing, Think Brewing, Tidehouse Brewing, TrailWay Brewing, Upstreet Craft Brewing, Western Newfoundland Brewing. Happy Friday y’all! We are deep into August now, and the weather in our region has been gorgeous, which bodes well for a healthy hop and grain harvest next month. Let’s take a minute to toast the hard working farmers and growers who keep the brewers fully stocked with great ingredients! • Tatamagouche Brewing is on the lookout for a Head Brewer! Having expanded several times during their first three years in operation, they are looking for an experienced brewer to join their ranks, and help them keep up with the great demand for their beer across the province (and beyond). In addition to day-to-day brewing tasks, familiarity with Quality Control, recipe development, cellaring, and maintenance are also requirements. As in all breweries of this size, the ability to wear many hats, and communicate with co-workers in the brewhouse is key! If this sounds like something you’d be interested in, check out the full job posting here, and fire off an email to Matt Kenny. • Wolfville’s Annapolis Cider Company released the latest cider in their Something Different series on the weekend, Raspberry and Rooibos. This 6.7% unfiltered sparkling cider begins with a dry cider base fermented over Red Delicious skins, blended with fresh juice from local, handpicked, raspberries. The blend was then cold-conditioned with Red Rooibos loose leaf tea from their neighbours at Just Us! Coffee. The resultant deep pink cider showcases a tannic structure, with plenty of fresh raspberry flavour and aroma, and a light earthiness from the tea. As with all of their Something Different releases, Annapolis is donating $0.50 from each sale to a local charity, with the Wolfville Children’s Centre being the current beneficiary. • 90 minutes down Highway 101 from Wolfville is Smiths Cove, home to Lazy Bear Brewing. They have upped the ante this week with the release of Sour Punch Kettle Sour. Featuring a similar hop profile to their Punch Session IPA, this 5.0% ABV Pale first underwent a controlled souring using Lactobacillus, before finishing fermentation with an ale yeast. During conditioning, it was generously dry-hopped with El Dorado, Idaho 7, and Olicana, for “a nice balance of tart and tropical fruity from those hops”, according to the brewery. The best way to grab Sour Punch, and its little sister Punch (which we understand will be back shortly), is at Lazy Bear’s Thursday evening Growler nights, and at their Annapolis Royal Farmers & Traders Market stall Saturday from 8AM. • Think Brewing, in New Brunswick’s Southwest region, has added a new beer to their roster, featuring all New Brunswick hops. Named after the area in which they are located, Tweedsider Pale Ale features 2016 harvest Centennial and Columbus hops from Southan Farms and Cascade hops from Lakeview Farm in Think’s neighbouring town of Harvey. Described as a “Classic ‘C’ hop Pale Ale”, with Columbus as bittering and plenty of late Cascade and Centennial for a bright citrus fresh aroma. The area of Tweedside got its name after the River Tweed in Scotland. Tweedsider can be found on tap at The Loch in Harvey (also adjacent to where those Cascade hops were grown), Cask & Kettle in Saint John, and Graystone in Fredericton. • Over on the western side of PEI, Moth Lane has a new beer available, this one with a name derived from folklore. Called Sidehill Gouger, apparently after a creature said to roam the dunes next to the brewery that has evolved shorter legs on one side of its body, it’s a wheat and barley beer brewed with an American yeast. At 5% ABV and 11 IBU, it should have a clean flavour profile and a refreshing character, perfect for the tail end of summer. • HRM’s North Brewing sees the release of the second beer in their Finite Series today, with the launch of Oh My Darlin, a Clementine Pale Ale. Coming in at 6.3% ABV, it’s been in development for quite some time. Leveraging a stainless tank from Battery Park, it underwent a secondary fermentation with Brettanomyces claussenii for six months before being dry-hopped with Mandarina Bavaria and packaged into bottles and kegs where it conditioned for another 1.5 months. Described as dry , with a “brilliant” brett funk and notes of clementine, this is an extremely limited release, with only 850 bottles (650 mL) and 3 kegs produced in total. As of noon today you’ll find it at both North bottle shops, and on tap at Battery Park and Stillwell as long as it lasts. So if you love the funk, you know what to do. • Things are coming together for Split Rock Brewing in iconic Twillingate, NL, with their opening fast approaching. As they count down the weeks and days until launch, they are looking to expand their team, looking for bartenders and servers for their on-site taproom. If you are looking for an excuse to go back home, or want a new adventure where you can watch icebergs and whales from behind the bar, get in touch with the Split Rock family in person at 119 Main Street or via social media. • Down Digby way in Nova Scotia, Roof Hound is ready to begin another new era for the brewery with the impending arrival of bottles to the packaging mix. Their first offerings in this format will be the Sweet Little SIPA session IPA, at 4.5% ABV, and their aptly-named (for all the right reasons), Big Stink IPA at 6.4% ABV. They’ve gone with the swankily retro 500 mL stubby format and if you check out social media you’ll see their cunningly designed counter pressure bottle filler. Speaking of social media (Facebook, Twitter, Instagram), that’s how you’ll best find out when these puppies (yes, we went there) will be available; they’re still technically waiting on NSLC approval after obtaining the nod on recyclability. Once they’ve got clearance, you’ll find the bottles available at the brewery and in the city at Bishop’s Cellar for now, with other avenues potentially developing over time. • If you’re keeping score on the wonderful things that have already come out of the foedres at 2 Crows Brewing, you’ll have likely notched a win for the Low Point Barrel-aged Burundi Coffee. If you’ve idly wondered what that lovely stuff might taste like if someone had the presence of mind to brew some up and put it in a beer, it turns out you’re not alone. Halifax’s Tidehouse Brewing got their collective grubby paws on some of that lovely coffee (no doubt at the mental, emotional, and possibly physical expense of Jeremy Taylor) and put it into an American Porter they’re calling Low Tide Foedre-aged Burundi Coffee Porter (you will be forgiven for ordering “Low Tide”). The grist for this 5.5% ABV brew was comprised of a 2-row malt base, Carafa II for color, and Pale Chocolate malt for roasty and chocolate notes, while the hop side features Magnum for a present, but only just, bitterness, and Bramling Cross for some red fruit and lemon flavour. Ideally this will provide an excellent platform for the sweet, boozy and vanilla components of the coffee. Release is expected to take place this coming Wednesday, August 23rd at 1 PM, where they’ll have a mere 350 bottles (500 mL) available, so if you’re interested, you’d best step lively – once they’re gone, they’re gone! • With the very many new TrailWay beers that have been hitting shelves and taps this past summer, it’s actually kind of surprising that they haven’t done a true SMaSH beer… until now! Lomah was released earlier this week, and features a grist comprised of 100% Pilsner malt, and a hop schedule made up entirely of Columbus. A hop variety that every brewer is familiar with, Columbus has been around for many years, and always brings more to the table than expected. Lomah in particular is described as “dank, spicy, and surprisingly tropical and fruity”, and weighs in at 6.3%. Available now in cans, pints and growlers at the brewery, TW is calling it “crisp, clean, and completely crushable”. • As usual we’ve got plenty to tell you about with regards to Good Robot in Halifax’s North End this week. First, the summer tradition continues with yet another new brew on the Gastroturf serving as Cask in the Sun this afternoon. This time it’s Leave Me Blue Popcorn, their Kentucky Corn Beer with house made caramel and lactose added to push it in a caramel corn direction. Next, this weekend will see the release of an almost-new Alpha Brew, previously released as a Beta Brew by Assistant Brewer Jake DeWolfe as his first solo brew at GR. El Espinazo del Diablo (the Devil’s Backbone, after a Guillermo del Toro film) is a Mexican Lager weighing in at 5.8% ABV and a light 14 IBU. With a grain bill of 2-row and Vienna malts and flaked corn, the noble hop Tettnanger for flavour, and the addition of both lime zest and jalapeño peppers for added interest, this is a light, but slightly hazy lager that should be quite refreshing. And lastly, this week’s Beta Brewsday on August 22nd is a collaboration between Beta system queen Kelly Costello and Jana Muise of Motion Bay Brewing (original name: Killick Stone), soon to be open in Petty Harbour, Newfoundland. This is a hoppy one called Stella Ella Oh La La with 2-row, Vienna and Flaked oats making up the malt side, for plenty of body and a little haze. On the hop side, there was a bittering jolt of Cascade out of the gate, and then a triple dry hop of Citra at 2 days, Ella (formerly known as Stella) at 4 days, and Citra again at 6 days! At a super-sessionable 4.5% ABV, but a healthy 56 IBU this very well might qualify as a NE Session IPA. There’s only one way to find out and that’s to be at GR next Tuesday when it’s tapped! • Woody Point is located on Newfoundland’s West Coast, in the heart of Gros Morne National Park. That’s where Galliott Studios, the officially unofficial taproom for Western Newfoundland Brewing Company, is located. The cafe/gallery/pottery studio/bar is also home to the Writers at Woody Point event taking place August 15-20th. With readings by authors, live music, and celebration of written and spoken word, the event has also been the perfect time for WNLBC to release a new beer, celebrating the 50th anniversary of the House of Anansi Press. The 3.5% ABV Ginger Wheat Ale features additions of Millet and Sorghum in the mash, as a nod to the legend of Anansi, an African folktale. Complementing the ginger, are locally-foraged Wild Rose and Wild Mint, collected by local group Northern Food Craft. The beer is currently on tap at Galliott Studios, and we don’t expect it will last beyond the weekend, so drop by today for a pint and story! What’s on the go in the next couple of weeks? • Charlottetown’s Upstreet Brewing is throwing their annual Block Party tomorrow, and it promises to be bigger and better than ever. With an open-air artisan market, the Most Wanted Pawn Shop’s Retro Video Game parlour, great food, and their own sodas pouring, there is something for everybody. This free event will also feature live music all day, from noon until late night. Check out the full details here, and drop by for a right good time tomorrow! • Next Sunday, August 27th, the crew from Charlottetown’s HopYard want to take you on an Island Wide Brewery Tour! Meeting at HopYard at noon, the bus will head up West to Moth Lane for a visit, then it’s off to BarNone for a pint, before heading back to town for a pint and bite at HopYard. The fun continues with a visit to PEI Brewing Company, before ending (or just beginning?) the night at Upstreet. Tunes and Trivia will be on the go to keep you entertained between stops. Tickets are available at HopYard now for just $50+tax. • ANBL is asking its customers for feedback about Online Shopping. Until August 30th at midnight, visit the online survey to have your say. It shouldn’t take more than 10 minutes and will, if you provide your email address, enter you in a draw to win one of three $100 gift cards from ANBL. Good morning, and welcome to another Friday! As usual, there’s plenty of beer news to share for the week, so let’s not waste any time with preamble. Ok, truth is the site was down for awhile and we lost a lot of changes, including a witty intro, and I just don’t have it in me to try to come up with it again! • Let’s kick off the week with the announcement of a new brewery on Nova Scotia’s South Shore. Heritage Brewing is opening their doors for the first time tomorrow, at 19 Kirk St in Yarmouth. From 11-3, they will be pouring their four beer for sampling onsite, and in growlers to take away. They will be pouring their Amber Ale, Blonde Ale, Session IPA and/or Stout all day (or until they run out!). Merchandise, including clothing and glassware will also be available for purchase. Look for a full Profile with the Heritage crew Monday morning. Congratulations on your opening! • Moncton’s Bore City is back on the board with a couple of new beers! First up is the recently-released Jus de Citra, which has been on tap at Marky’s Laundromat for a couple of days and is going fast. This American IPA is hopped entirely with, you guessed it, the beautiful Citra variety. A simple grist of Pilsner and 2-row malt, along with a healthy amount of Flaked Oats to boost the body, lets the tropical juiciness of one of our favourite hops shine through. Fermented with Conan to boost that juicy character even further, it weights in at 6.5% ABV and 68 IBUs. If it’s out at the Laundromat by the time you read this, fear not… you can always make the trek to Fredericton’s James Joyce, where it should be available on tap any time now. • The other new beer from Bore City has been brewed and is just finishing up fermentation. Accordingly named Koalatee Pale Ale, this one was hopped with three Australian varieties: Ella, Summer, and Vic Secret. Expect plenty of citrus and tropical fruit in this brew as well; it should clock in around 5.5% ABV, and will be available within the next few weeks. As always, we’ll keep you updated! • Now that there’s finally some inklings of nice weather in our area, those of you in Fredericton have a good excuse to head over to TrailWay Brewing to check out their new-and-improved patio. Luckily, they’ve also released a brand new beer to give you yet another excuse! Blueprint is the brewery’s latest Porter, described by the brewery as “chocolate-forward, sessionable, dry and crisp”. A popular style in the taproom (where you can pick up growlers, pints, and cans), this 5% ABV brew will also be available on tap around the city. • Sticking around Fredericton, Half Cut Brewing has their first new beer in a while out and about the city. Tickle Fight IPA is a 5.8% ABV American IPA hopped with Warrior and Sorachi Ace, giving an “ample amount of bitterness, with lots of fruit character, including citrus, mango, and passionfruit”, according to the brewery. Look for it on tap at your favourite Half Cut tap account today. • In cider news in the city, Red Rover has their first cask-conditioned release on at the Cider House as of this week. Paradise is a 7% ABV dry cider with a “sweet aroma of pineapple and a dry apple finish”; available only for glasses served in-house at the downtown location, be sure to drop in and try this limited released while it’s still available! • You may have noticed an announcement from Petit-Sault about a new beer of theirs, La Madoueska, which they’re referring to as an “Acadien Brown Ale”. Brewed with a combination of “Pale, Caramelized, and Toasted malts”, it has an aroma of freshly-ground coffee beans and dark chocolate, accompanied by a fairly dry finish. There will be an announcement later today by Sebastien Roy of Fils du Roy regarding this new “style”; you’ll likely be seeing several beers brewed in this way from Acadien breweries in the coming weeks. In the meantime, the 6% ABV La Madoueska is available on tap at the Petit-Sault taproom for pints, bottles and growlers, at ANBL growler stations this weekend, and in bottles at select ANBL stores. • Good Robot is bringing back last year’s The Shocking Pink, a Gose-Radler hybrid of sorts that they originally introduced for the 2016 OUTeast Film Festival in Halifax. Well, the festival returns on June 15th, and so does version 2.0 of the beer! This hazy, straw-coloured beer is the brewery’s Goseface Killah with pink lemonade added, as well as organic teas “Queen of Tarts” and “Fruity Oasis” from DAVIDsTEA. Tart, salty, lemony, and fruity, v 2.0 will be launched on the 15th when the festival opens; look for it on tap across the city. • Wolfville’s Annapolis Cider has released the latest in their Heritage Series, Old-Fashioned Gravenstein. Using only hand-picked, local Gravs, they crafted a 7.4% ABV cider with a fresh apple aroma and crisp, tart, flavour. This release is available exclusively at the cidery on Main Street. • Mill Street St John’s has released a new beer, taking inspiration from Italy. Terrazza Lager clocks in at 4.8% ABV and 30 IBUs, featuring biscuit and bread notes, with a spicy hop character from Saaz hops. Grab a pint or growler at the bar today, and at EVOO in the Courtyard, at Water and Beck’s Cove. • Digby’s Roof Hound Brewing is putting the finishing touches on a brand new beer set to mid-next-week. Thyme to Grow a Pear Blueberry Kettle Sour is a complex and flavourful beer that will be hitting their taps, as well as licensees shortly. Featuring a light base from Pilsner and Wheat malts, the beer was soured in the kettle thanks to a healthy dose of yogourt (which contains the necessary Lactobacillus bacteria). After a couple of days letting those guys do their work, the beer is boiled to kill them off, at which point Pear puree was added. After further fermentation with a traditional yeast, Blueberry puree made its appearance in the beer. And while the beer finished its conditioning and carbonation, fresh Thyme was added to the brite tank. All of this culminates in a 3.9% ABV acidic, yet clean, beer, with a lovely thyme and fruit finish. • You may have spotted a new publication in Nova Scotia breweries this week, the NS Beer Guide. Published independently from any brewery or organization, it aims to put the information for all Nova Scotia breweries together in one book for easy reference. Follow along on their social media pages to see where the guides have been delivered to grab yours over the next few days, as they visit all of the breweries in the province. • On the Isthmus of Chignecto (try saying that after a couple beers), Trider’s in Amherst has a new beer in bottles. My Honey, My Heather is the result of experimentation that followed after a local honey producer approached Trider’s and asked if they wanted to do a honey beer. The beer uses a few buckets of wild honey and the team is pretty happy with the result; it also contains heather, hence the name. Meanwhile, if you’re in Halifax and you’re wondering where you might find Trider’s brews on tap, we’ve got the scoop: The Local on Gottingen has had White Ogre and Rod’s Red, The Stubborn Goat will be serving Rod’s Red as well, and the Timber Lounge will have 500 ml bottles of the Brew-Deau. More accounts will no doubt follow in coming weeks; we’ll let you know as we’re made aware. • On the South Shore of NS Boxing Rock is holding a contest to name their latest beer, this one a Cream Ale brewed specially for the Tall Ships visit to Shelburne on August 14th and 15th as part of the RDV2017 Guest Port Program in Canada to celebrate Canada 150. Your prospective name needs to be submitted in person at the brewery (open 7 days a week, 11AM – 7PM) between June 8th and July 8th to qualify. The winner will be revealed at Boxing Rock’s birthday party celebration on July 8th. This isn’t a ballot-box stuffing style contest, it’s all about creativity, and we’ve been assured that “Beery McBeerface” isn’t in the running. We’re told that the beer itself is light and easy-drinking, with a grist comprised of 100% malt. Hopped with both European noble and North American varieties for a light bitterness and mild aroma, it weighs in at 5% ABV. • Halifax’s 2 Crows tapped a new beer yesterday afternoon, a “super tropical” brett pale ale called Angel Eyes. Fermented with a blend of Brettanomyces strains, it’s a healthy 6.5% ABV and a solid 34 IBU. Dry hopped with new world hop varietals Azacca, Galaxy, and Citra, expect a juicy and funky presence, with a dry finish and a strong pineapple and lemon notes. Brewmaster Jeremy Taylor even gave a shoutout on Facebook to our own Shawn Meek and a similar recipe he concocted a couple of years back (but don’t tell him that, it’ll go right to his head). This is a very limited release, with only 250 litres available on tap at the brewery. And speaking of the brewery, 2 Crows now has a patio with seating for 20 out front on Brunswick Street. We suspect that a pint of Angel Eyes and a seat on the patio might be an excellent squad goal for craft beer lovers in Halifax this weekend! And if Brett isn’t your thing, there’s still some of the 2 Crows x 902 BrewCast In Theory to be had. • You may remember the Pucker Up Cranberry Hibiscus Wit originally launched by Garrison back in 2015. They’ve revamped the beer as a kettle sour, and have re-launched the beer as Pucker Up. This bright red beer is brewed with Pilsner and Wheat malt, and was soured with Lactobacillus bacteria, before being briefly boiled (but no hops were added to the brew). It still has the pomegranate and hibiscus notes like the original beer, and comes in at a quaffable 4.7% ABV. The brewery describes the taste as “Fun Dip for adults”, which probably gives you a pretty good idea of the flavours! Available at the brewery for tasters and growlers now, look for it to follow at local tap accounts very soon. And in other Garrison news, they’re once again putting out calls for locally-grown rhubarb! Bring your fresh, usable rhubarb in to the brewery (leaves removed, please) for a free taster, plus an in-store credit of $1 per pound (limit of 10 lbs per person). Another busy weekend ahead of us, folks! • Starting today, visitors to Schoolhouse Brewery‘s new Windsor location will be able to grab a full pint of Schoolhouse’s, and guest breweries’, beer. Drop by 40 Water Street today at 3:20PM (when school lets out, off course) until 9PM, or on the weekend from 11AM. While there, pick up your tickets for their Graduation next weekend, and GradParty after the day’s “formal” fun is done. They’re hosting a Four Square Tournament that day as well, be sure to sign up early to secure your spot! And keep your eyes open for the return of favourites Skratch Plaskett – Electric Tambourine Ale and Vice-Principal Session IPA, both slated for their return next week. • Good news (Prince Edward) Islanders! Beginning tonight, BarNone Brewery in Rose Valley is open for pints and growler fills on both Thursday and Friday evenings! From 6-10pm both nights, drop by the brewery to check out what’s newly released, what’s coming next, and take a seat upstairs in the auditorium for some great local music. Friday’s music leader is Jon Rehder, and will feature plenty of local and visiting musicians throughout the summer. • There are few good reasons to stay close to Moncton’s Tide & Boar tomorrow morning: at 10AM they are holding the latest of their Growler Fill Mornings, when they offer some of their house-brewed beer in a take-away format. This weekend’s offerings are Pow Pillows IPA (a New England-style IPA with Citra, Galaxy, and Nelson Sauvin hops, with some lactose for residual sweetness), Hand PlantIPA (all Galaxy, and a non-flocculating yeast for a hazy outcome), and Layback Lager (brewed with rye, New Zealand hops, and fermented with a German lager yeast). 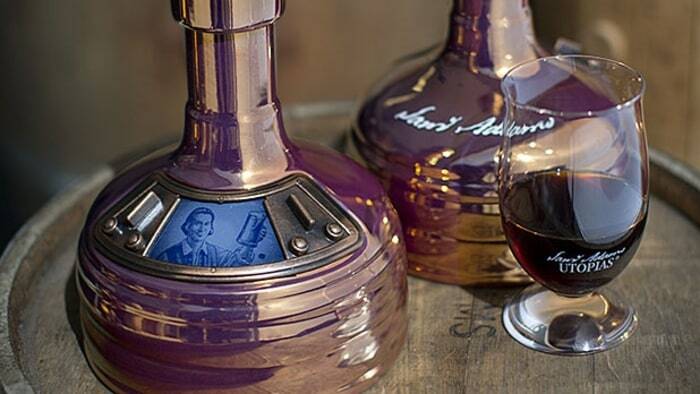 And stick around until 11AM, where you can grab a pour from their single bottle of Sam Adams Utopias, the 25%ABV+ beer that drinks more like whisky than a beer. Plus those who do purchase a 1 ounce pour with have a chance to win the iconic bottle. – June 12th at Quidi Vidi. 4:30-10PM. Sample all twelve beers, plus grab pints of QV’s collab brew too. Food onsite. Facebook Event. – June 15th at PEI Brewing Co. 5-9PM. Live music and pints of the PEIBC collab beer. Facebook Event. – June 16th at Picaroons. 5-11PM. Live music, collab 12-packs for sale, food and beer. Facebook Event. • After a brief stint on tap last month, YellowBelly has brought back their Ryan’s Fancy IPA, which is available in bottles at the brewery now, and select NLCs this weekend. Celebrating the eponymous iconic band that formed in 1971, the beer will be re-launched in earnest June 13th at their “What a Time – Volume 2” CD release party at O’Reilly’s Pub, at 7PM. • The Moncton Beer League will be holding their next Urban Beer Hike in downtown Moncton June 17th. Start your afternoon of fun at Marky’s Laundromat, and hit up four other bars for a taste of the region offers. Grab your tickets today! • We don’t want the summer to go by too quickly (hey, we’ve earned it! ), but a reminder that tickets for this year’s Atlantic Canadian Craft Brew Oktoberfest (being held on Saturday, September 30th) go on sale today at noon. Featuring unlimited beer samples from many local craft breweries, there are two ticket options available: regular tickets get you entry from 7:30-10:00 pm and a takeaway glass, VIP tickets get you in at 7 pm, and “VVIP” tickets get you a special glass, access to an industry panel discussion, and a guided beer tasting. Ticket prices range from $58-$75+fees, and are available here. Check out the link for additional festival details. As in the past, funds will help support the United Way of Greater Moncton. – Attention, Halifax beer drinkers: keep your eyes open for a new Tidehouse brew, Simcoe Krush (5.2% ABV, 30 IBUs), an American Pale Ale focusing strongly on Simcoe hops.